Cartagena is a city in the Murcia Region in the southeast of Spain and has around 212,000 inhabitants, making the 24th largest city in the country, though the second in the region. Cartagena concentrates an artistic legacy that summarizes almost three millennia of Spanish History, being inhabited by most great Mediterranean Empires that have conquered the Iberian Peninsula sometime. Cartagena is a city full of monuments, with many archaeological sites and outstanding buildings of historical interest, together with the charm of the sea and the typical bustle of a port city. Dirty and very polluted in the past (due to the nearby Refinery), the new redevelopments (like the initiative "Cartagena, Port of Culture") and restorations have turned it into a major tourist destination, and is a frequent disembarkation point for numerous cruises. Its wide municipal territory also include part of the famous holiday resort La Manga del Mar Menor, part of the Mar Menor coast and several protected areas of natural beauty near the coast. Roman remains, including the brand-new Roman theatre, recently restored. Also of interest is its Museum. Modernist houses, made by the pupils of the famous architect Gaudi. Including the former Town Hall, the Gran Hotel, the Casino and the Casa Maestre, among others. The Promenade and the harbour, including the famous Peral Submarine and the ARQUA (National Museum of Subacquatic Archaeology). Other ancient remains (of punic, byzantine or arabic origin). Several churches throughout the city. Cartagena has a typical Meditarranean climate with warm, sunny and dry summers and mild but wetter winters. Average summer temperatures from June to early September are typically around 30 °C though can hit 40 °C or more sometimes. Nights are warm, mostly around or just above 20 °C. Winters from December to February are mostly around 15 °C during the day and nights can be chilly but rarely really cold. The airport of Cartagena (and Murcia) is Murcia-San Javier Airport (IATA: MJV / ICAO: LELC) and is located about 25 kilometres south of the city. It has connections with Air Berlin to Palma de Mallorca, Bmibaby to Birmingham and Cardiff, Easyjet to Bristol, London-Gatwick and Newcastle. Iberia (Air Nostrum) offers connections to Barcelona and Madrid, Jetairfly flies to Charleroi in Belgium (Brussels South Charleroi Airport). Norwegian Air Shuttle flies to Bergen, Oslo-Gardermoen, Stavanger and Trondheim, and Ryanair to Birmingham, Bournemouth, Dublin, East Midlands, Glasgow-Prestwick, Leeds/Bradford, Liverpool, London-Luton, London-Stansted. There are also some seasonal flights with the following companies: Jet2.com to Belfast, Blackpool, Edinburgh, Leeds/Bradford, Manchester, Newcastle. and Monarch Airlines has flights to Birmingham, London-Gatwick, and Manchester. Another option is to fly into Alicante International Airport, about 80 kilometres to the north in the Valencian Community. La Tartana, (Puertas de Murcia) - Mediterranean food. La Tagliatella (near of the Roman Theater) - Italian Restaurant. La Mejillonera, (Calle Mayor) - Seafood and good fish. Mare Nostrum, (in the port) - Mediterranean food. Mesón Jamaica (Calle Canales) -Mediterranean food. La Marquesita (Plaza de Alcolea nº6) - Mediterranean food, too expensive but excellent food. Maricastaña - affordable tapas bar. The most popular bars in Cartagena are on Calle Aire, just a street over from Calle Mayor. Popular sites include The Chaplin Meeting Club, Baronesa Music Room, and La Chämpa. A more tranquil option is Mister Witt Café on Calle San Roque. 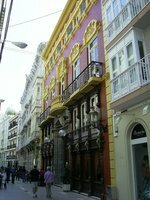 But if you're into dancing, El Telar is nearby on Calle Villamartin and 600m farther is Teatro on the corner of Calle Jabonerías and Calle Lic. Cascales. A popular Latino club outside of the city center is Tributo on Calle Jorge Juan (near El Corte Inglés). This is version 5. Last edited at 9:31 on Jun 14, 17 by Utrecht. 6 articles link to this page.